Kalamata olives, sometimes spelled as "calamata," provide a rich and fruity flavor. 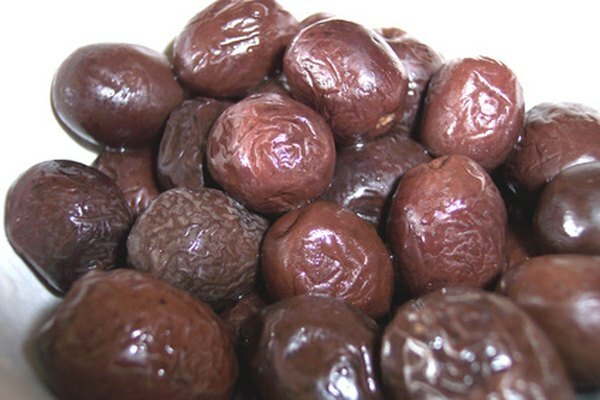 This black-purple olive imported from Greece contains large pits, although you may commonly find them in their pitted form in grocery stores and specialty shops. You can snack on these olives by themselves or chop them up for use in recipes. Just be sure to consume them in moderation, as they are high in sodium. A serving of five kalamata olives has 45 to 50 calories. The Diet Channel notes that a snack should contain 100 to 200 calories to provide a boost of energy when you need it and cut hunger, so to bring a handful of olives into the correct range, consider serving it with a small amount of of prosciutto or feta cheese. You may also consider eating kalamata olives with raw vegetables, such as baby carrots or cauliflower. The kalamata olives in your meal plan provide almost pure fat -- the 5 grams in each serving of olives account for nearly all the calories. Despite this, including these olives in your diet does not eat up much of your daily limit of 44 to 78 grams, or 20 to 35 percent of your total calories from fat, on a 2,000-calorie diet. Do not regularly consume more fat than the typical allotment or you risk increasing your chances of gaining weight. You’ll also get 2 grams of carbohydrates, a macronutrient key to providing energy. You should consume at least 130 grams of carbohydrates each day to meet your energy needs, so enrich your diet with foods high in healthy carbohydrates, such as grains like millet and quinoa, as well as potatoes and other vegetables that provide fiber along with those carbohydrates. A serving of five kalamata olives contains 1 gram of fiber, a type of carbohydrate that does not break down into fuel. Fiber promotes bowel and digestive health. It is vitally important to include iron-rich foods in your meal plan. While kalamata olives cannot be considered “iron-rich,” they do give you a small boost in your iron intake -- each serving provides 2 to 3 percent of the daily value for iron. Iron promotes adequate levels of oxygen in your body, and without it, you may suffer from a condition known as anemia. This medical problem is marked by fatigue, headaches, muscle weakness and dizziness. Kalamata olives are quite high in sodium, owing to both natural sodium content and salty brine often used to cure this food. Each serving contains 260 to 413 milligrams of this mineral, which is 17 to 28 percent of the recommended limit of 1,500 milligrams. Consuming too much salt can cause you to retain water weight, but it can also lead to more serious health problems, such as high blood pressure.